Descrittione Dell' Isola Di Corsica - PORCACCHI, T.
Title : Descrittione Dell' Isola Di Corsica. Map maker : PORCACCHI, T.. Date : Padova, ca. 1590. Size : 4.1 x 5.6 inches. / 10.3 x 14.2 cm. 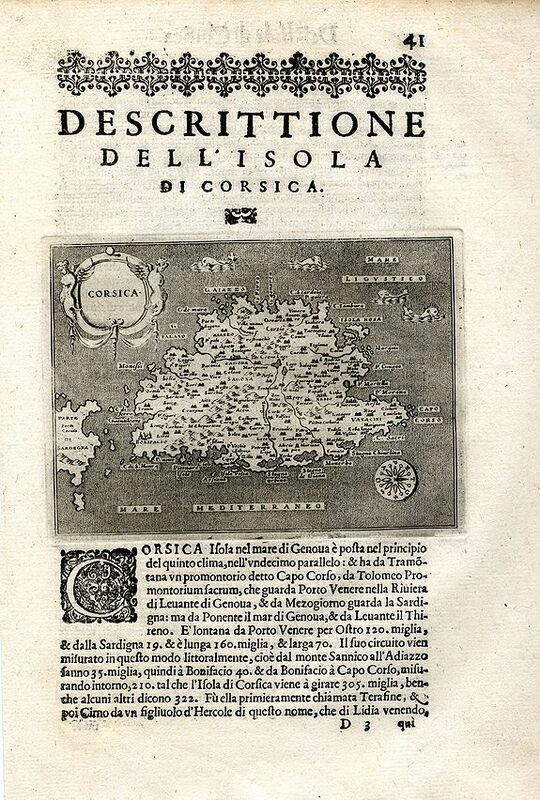 Description :Rare early map of the Frechn island Corsica and a small part of Sardinia. Published around 1590 in "L'isole piu famose del mondo". Very detailed naming many even small towns, and indicating mountains, rivers, lakes, and smaller islands. Beautifully engraved with small pictoral symbols for the towns and decorated with seamonsters, a compassrose and an embellished title cartouche. With stippled seas, and oritentated with North to the right. Extensive descriptive Italian text on both sides of the sheet. Condition : Dark and mostly clear impression. Light age-toning and soiling to the page, map area clean. Left margin cut unevenly but far away of any printed area. Some browning to the edges of the margins. Nice example in very good condition.